Gil Hibben Highlander Bowie Damascus with Sheath | BUDK.com - Knives & Swords At The Lowest Prices! Right from the start I felt the Highlander Damascus was overpriced, but I was happy with the standard model, so when there was a 30% sale I gave in. I got the knife and it was very dull and took about an hour to buff and polish the blade to get any pattern out of it. When the pattern did appear, it was dull, faded, not a quality Damascus process. I must say I have been very impressed with the quality of the Pakistan made Timber Rattler and Timber Wolf to be superb. But the Chinese made Damascus I'm not so impressed. After sharpening and buffing it's O.K. but still at 30% off I think it's overpriced. The "knife" arrived quick enough but was so dull out of the box I could NOT cut myself on the blade. I started to sharpen it, and the plastic case from the sharpener took off the "folds" on the blade. I should have started with a stone but it was too dull. The swirls from the folding come off if rubbed with a rag for several minutes. Did I get a knock off or does Damascus just mean a blade with painted swirls on it? If you just plan to display it, this is a nice knife but has no practical value as shipped and cannot be sharpened without losing some of the markings which distinguish it as "Damascus." This is the first thing I have purchased from budk that hasn't exceeded expectations and the staff was great about helping with the return. A very good knife, very nice sheath, and it is Damascus - about 1,200 layers. The problem is that it arrived dull! Not sharp! So, now I have to sharpen it, and I will have to be very careful with a Damascus blade. I needed a large, durable fixed blade knife for every day use in the field and this knife is beyond expectations. Perfect balance and weight. The wire grip is a must when using a knife more than 50 times a day. I needed a large, durable fixed bladed knife for every day use and I ended up with a knife that I am going to cherish for a life time. I will have to get another one to use in the field. So, I will have a collectable one and one that will get used more than 50 times a day. It has a perfect balance, great feel and the wire wrapped handle is a must if you intend on using it a lot. I have started collecting knives and pretty much any type of bladed weapon that can be used for different reasons. I just got it about a week ago, and it is by far my favorite knife I have in my collection. One it is just a beautiful knife, and second the quality and the sharpness right out of the box I was happy with which is usually never the case. Everyone that has seen it has commented on it and asked where I got it. It cuts very well and chops well easily too with no damage what so ever. The sheath is nice as well as far as I am concerned and have had no problems at all. I would recommend this knife to anyone from the collector to just someone who wants just a great quality knife. Will definitely be buying more Bill Gibben knives for my.collection from now on. Save up and buy is my motto now. Like people say you get what you pay for and this time I got more than I paid for in my mind. Definitely buy this knife if you need or want a gret knife for whatever reason in your life. Ladies if you want a second sure fire way to put a smile on your man's face this is it. Im a Biker this is a beautiful well put together knife. 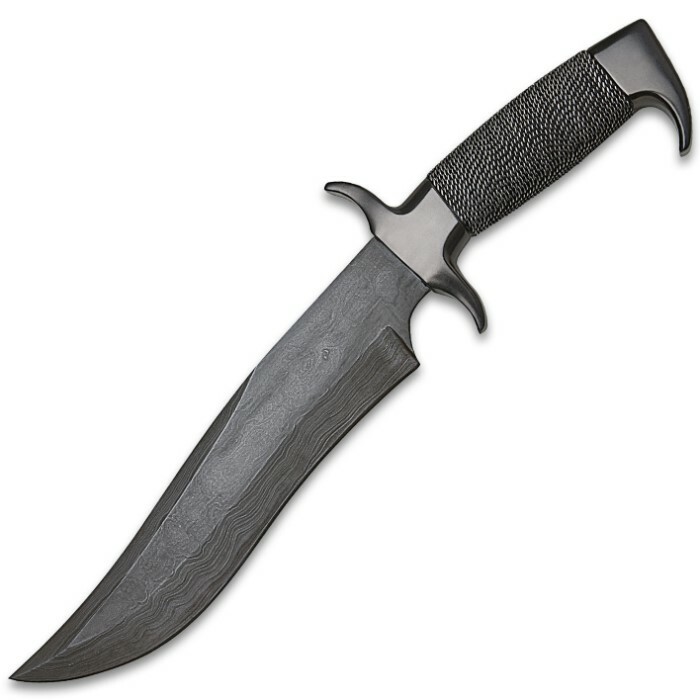 The Damascus blade is stuning, the pomel,handle and blade is like one solid piece of metal rock solid just flows as you grip it tight. ( Not like some stupid deer knives with a screw in the end that comes loose from being on your belt ). Blade is sharp as a razor for use or just add to your collection this is a prize piece and any of your friends see it you will be their envy. The leather case is no slouch either thick and sturdy. I Have A Big Collection And I Like This Knife, The Best Of All. 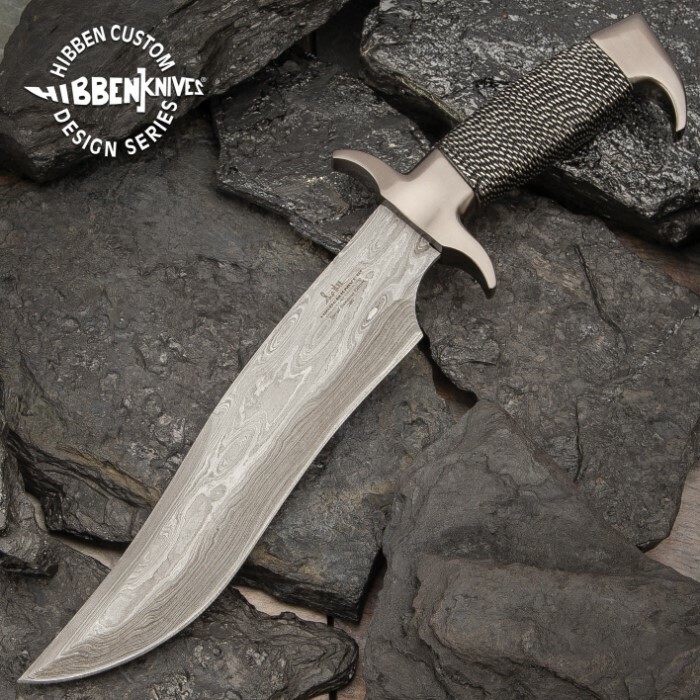 I own a number of Gil Hibben knives and up to this purchase I have had no complaints. This knife however arrived with a bent tip. The only thing I could do was to file it down until it was almost straight.